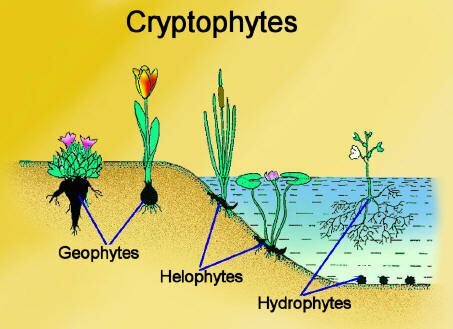 A hydrophyte is a plant that grows in water or in water-logged soil, with submerged storage organs and perennating bud (s) resting below the water level. Hydrophytes have a reduced root system, reduced support and vascular systems, and specialized leaves. Anchored hydrophytes have a rooting system that is embedded in the soil and they often have floating leaves. Plants with resting buds lying either beneath the surface of the ground as a bulbs, corms, rhizomes, etc., or a resting buds submerged under water. Helophytes: resting in marshy, lake or pond edges, e.g. Reed Mace. Hydrophytes: resting by being submerged under water, e.g. Frogbit. (Compare with mesophytes, xerophytes, halophytes and xerohalophytes). Hydric environmental conditions are ones that are very wet. Compare with very dry conditions (xeric) and medium moisture conditions (mesic).